A superb game of cricket has been played today in the first ODI between India and South Africa. As expected South Africa decided to bat first after winning the toss. Openers of South Africa played well when they fell and soon after the arrival of AB De Villiers South Africa blew a strongest target till the end as he was unbeaten throughout at 104 on just 73 balls. Because of the stunning performance if the South African skipper, the team achieved a high total of 303. 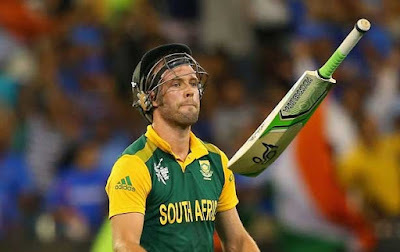 Indeed South Africa maintained its vigilant and brilliant power throughout the game and Indian bowlers could not made themselves easy to dismiss AB De Villiers which was actually a key to success for South Africa. Under the superb guidance of AB De Villiers and the good partnership of Faf du Plessis and ABD South Africa established a big total for their rivals. South Africa was 303-5 in the end of fifty overs, but soon as the Indian openers started the game they played consistently. Rohit Sharma and Shikkar Dhawan set the game to less then 100 in 10 overs but Dhawan dismissed by Morne Morkel and Ajimka Rehane entered and the partnership went stronger to 150 plus. Openers of India showed brilliant efforts to achieve a high target set by South Africa. In the middle overs it was quit expected that India would win the game very easily but due to the poor captaincy of Dhoni they lost the game. There were some factors behind it, firstly Virat Kohli should come on number 2 or 3 but he came late which can be one of the factors of their defeat. Secondly the irresponsible bating of Indian skipper MS Dhoni is another factor. But on the other side the smashing batting of Rohit Sharma led his team to the closer, but unfortunately his efforts went in vain. And India did not attain five more runs and lost the first ODI in Kanpur. Another bad news for India is that its most eligible bowler Ashwin got injured in this match therefore it is expected that he would not play next ODIs which will loose India's strength. Star sports broadcast India vs South Africa live cricket match streaming in India and in South Africa Super sports do this job.